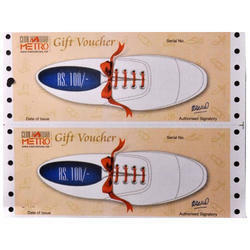 The gift vouchers are used for promotion of products. 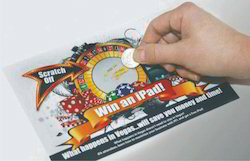 We supply gift vouchers with scratch and hologram for high security to avoid tampering. With Over 100 National Brands as partners you can gift your employees and colleagues gift vouchers & cards of brands like Dominos Pizaa, Shoppers Stop, Lifestyle Stores, Pizza Hut, Central Mall, Big Bazaar, Pantaloons etc. Celebrate your gifted relations with "gujari" gift vouchers, for corporate gifting of personnel gifting, theses vouchers are available in the denomination of rs. 250, rs. 500 & rs. 1000 redeemable at our Chandigarh & Ludhiana stores. Primarily designed for tickets and vouchers, coloured centre papers are the perfect choice for security applications where simple and fast verification is essential. Suitable for litho and digital printing, coloured centre comes in a range of standard colours as well as bespoke internal colour options. Engaged in providing services such as Gift Vouchers. With a wide range of Natural Beauty treatments including Facials, Full Day Spa Packages, and more to choose from, our gift vouchers are the perfect way to show you care! Vouchers begin from Rs. 1000 onwards. Payment for the vouchers can be done while collecting the vouchers at any of our centers in Mumbai or via Online account transfer. Gift Voucher A5 size 130 gsm art paper serially numbered. - Compact size: 2-3/4" x 3-3/4"
Pizza Hut Gift Voucher is the best gifting option since this is sure to bring a smile on the face of even the most sullen people. When it comes to celebration time, good food option takes the priority; and as everybody knows anytime is Pizza time! So, what does this tell you When you are in the mood to celebrate, Pizza Hut is your obvious destination.